This Multimedia exhibition utilised a full range of mediums including film, solargraphs, digital printmaking, installation and painting - giving the show a multi-dimensional interpretation of this fascinating group of countries. A full colour catalogue is now available. There's still time to head down to Finsbury Park to see my latest work in the gallery at Park Theatre. The exhibition runs until 30th April 2018. The artists showing at Tripp Gallery apply techniques to imbue the image with a symbolic dimension that speaks to the moment of having nothing left to say, when words and sounds fall silent. They also utilise visual, tactile and olfactory senses to tell their story. Exit left out of Station Place then left and under the bridge. Then second left onto Morris Place, Park Theatre is at the end. "Images of women in a range of feelings. GLOW celebrates how wonderful a woman can be in the most simplest of settings." Selecting work for my next project! Here I am with my friend the artist Julie Fountain visiting Olha Prymaak's studio. We had a great chat about our work, ideas and future projects. I am pleased to announce that one of my paintings has got through to the second round of judging at The Royal Academy of Arts. There were 12,000 applicants. Our central London exhibition Desktop was a success! We received lots of positive feedback!! An assemblage of computer, pens, books, paper weights, elastic bands and blue tac, visible on a desk, establish the possibility of “work” within the domestic sphere. Yet these same mini-exhibitions of material objects appear oddly domestic, or personal when clustered on the desks of office spaces, providing an echo of the mundanity of everyday life within the increasingly corporatized spaces of work. Indeed, the word desktop, used to describe the computer interface, often uses icons that are visual representations of these material objects, cut free from their situatedness in either home or work. The artists in this exhibition use the desktop as a starting point for explorations of the transitions between work and everyday spaces, and between virtual and imaginary spaces. The desktop has the ability to transport us from the domestic to the public, from the actual physical world, to worlds of pure imagination, such as the augmented reality of cyberspace. The exhibition is a study of these complex processes of migration and reality. Roland Hicks’ artwork includes paintings, sculpture and trompe l’oeil reliefs which scrutinise the overlooked items of our daily lives. The pieces on show in ‘Desktop’ examine items of stationery turned into spontaneous sculptures, evidence of a minimal creative gesture. These intuitive creative acts, hastily assembled, are slowly and painstakingly recreated under Hicks’ hand, amplifying even the smallest of gestures and making us reconsider the mundane material that surrounds us. Rubber bands, push-pins, blu-tack and pieces of tape acquire an intriguing presence as he builds a tense relationship between figuration and abstraction. His works possess an inherent sense of absurdity as to why someone would assemble such compositions and it continues to question the point at which something becomes ‘Art’. Hicks playfully distorts where his creative process begins and ends; whether it is through the original assemblage, the painting process or the hand sculpted re-creation. Concerned with both the beautiful and banal, his work is infused with dualities; it is earnest yet playful, abstract and at once figurative, both simulated and authentic. Sirpa is interested in exploring a mix of various media and materials. Layering them becomes a focus and part of the concept. Sometimes she uses elements originating from wood cuts carved over 30 years ago by her late mother the artist Seija Guttormsen . She uses photography ether found in old newspapers or that she has taken herself. Her artworks are created through multiple layering and by a process of deconstruction and arrangement. The final image combines an exploration of a range of materials (paints are bought from both art shops and DIY shops), with an investigation of the connections and associations of the visual history, whether aquired or inherited. Baraitser's work pays homage to the greatest designs of the twentieth century. Her recent paintings are a series based on Copenhagen's fashionable “Illums Bolighus” department store, the kind of shop where people go for retail therapy or more often to simply imagine themselves living in their dream home. The spaces are inviting - the bright lighting sales floor is an attractive place that is flooded with warmth, hovering between shop, home and a giant dolls house. For DESKTOP she has painted a designer lamp surrounded by towers of books. This, at the end of an era of western civilisation, is specific to the contemporary relationship we have with places we call home and spaces we inhabit. The sculptor Ekkehard Altenburger grew up on a farm at the Swiss / German border, and is based in the UK since 1995. He studied sculpture - first at Bremen's Hochschule fuer Kuenste and later at Edinburgh College of art. He finished his studies in 1999 with an MA from Chelsea College of art in London. Prior to his academic studies, he worked as master mason at the Gothic Cathedral of Schwabisch Gmuend in South Germany. Architecture has always influenced his work, which was the main reason for moving to London, to develop a practice very much inspired by the city that constantly inspires, challenges and informs his work. Meeting and filming the then 94 year old architect Oscar Niemeyer in 2001 in his Office at the Copacabana left a lasting influence. His work explores the physical balance of the built environment, using architectural references as well as sculptural volumes of physical material. This balance is also represented in the relationship between form and surface of a sculpture. Altenburger often uses texture and colour to manipulate surfaces, adding a further layer of information to a sculptural form.Altenburger usually works in heavy materials, mainly steel and stone. More recently he has developed prints and drawings in paper, which appear as assembled reliefs. Many of his works are in the public domain, where he developed site-specific works for both private and public clients. Due to the scale of his works, Altenburger regularly works with quarries and Granite / Marble factories throughout Europe. Kasper studied his BA in Fine Art and History of Art at Goldsmiths College, University of London in 2001-4, and Postgraduate Diploma in Fine Art at the Royal Academy Schools, 2004-7. He lives and works in London, and is represented by dalla Rosa in London and Aanant & Zoo in Berlin. Recently my work has become more and more focused on a process that achieves the maximum effect from the most economical, if repetitive, of means. Originally my work was interested in the aesthetics of the vicarious experience of 'exploration' with research conducted via library books, slide shows and borrowed narratives from episodes such as the ascent of Everest or the Kon Tiki expedition. It seems to have flipped now from images of the heroic, underscored by the domestic and mundane, to an almost heroic performance of that mundane and bureaucratic process- typing the letter 'o' almost two million times on a typewriter or photocopying every page of the encyclopedia onto one sheet of paper. My DeskTop painting will be exhibited next year at The Office Group, Henry Wood house, Picadilly Circus, London. Watch this space. This is the work in progress in the studio, Cambridge. I am pleased to announce that my latest work has been accepted to exhibit at the Open For Art annual exhibition. I am pleased to announce that my exhibition Scandinavia: A Celebration of the Nordic Province will be exhibited at the The Willesden Green Library Gallery . 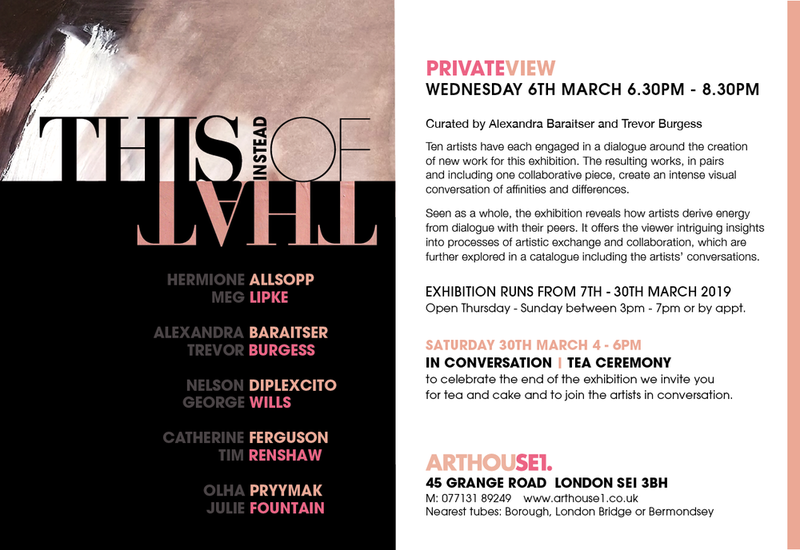 I am going to be showing my latest work. "The exhibition Scandinavia: A Celebration of the Nordic Province, curated by Alexandra Baraitser, takes a closer look at Sweden, Norway, Denmark and Finland. These sparsely populated nordic lands with dense forests and dark winters add to the region's strong sense of individuality and unique strength of character. The work in this exhibition is suffused with the landscape of the region - as well as with its unusual and iconic design history. Jan Svenungsson presents 66 drawings of Scandinavia titled Psycho-Mapping Scandinavia - an impressive three metre installation of Scandinavian maps. This is the first artwork you see as you enter the gallery. Psycho-Mapping Scandinavia has been exhibited a number of times in the form of either high quality photocopies of the originals, or digital printouts. At the centre there is a screening of Kaamos (Katie Goodwin, 2015), a film shot in 16mm in two Finnish locations: the first part whilst Goodwin was artist in residence on the 18th century fortress island of Suomenlinna near Helsinki in the south and the second part when the artist travelled to Northernmost Lapland to dwell in darkness and experience Kaamos (the polar night), where the sun does not rise for two months. Canister A/B/C are a photographic series where Goodwin installed pinhole cameras to record the sun's movements over a period of weeks when on Suomenlinna. This was for Helsinki artist Traja Trygg's solargraphy project. The residency was funded by the Australian Council for the Arts and British Council's International Development Fund. Sirpa Pajunen-Moghissi has installed a collection of small paintings that explore woodcuts by her late mother Seija Guttormsen, also a Scandinavian artist, and carved over thirty years ago. Pajunen-Moghissi employs the technique of collaging and layering multiple fragments and through the process of deconstruction and rearranging, she creates her own images. Alexandra Baraitser's large canvases pay homage to the greatest Scandinavian Design of the twentieth century. Baraitser's most recent works have focused on the lighting designs of Danish designer Poul Henningsen (1894 - 1967 ) who worked with the Danish manufacturer Louis Poulsen. They are still popular today and by painting them, Baraitser invites discussion of the relationship between “high art” abstraction and contemporary design. This fantastic multimedia exhibition utilises a full range of mediums including film, solargraphs, digital printmaking, installation and painting – giving the show a multi-dimensional interpretation of this fascinating group of countries." Above: "Psycho-Mapping Scandinavia" drawing No.1 by Jan Svenungsson from a series of 66 drawings in black ink on paper, each 42x29,7 cm, 1995. An animation of all 66 images is available at http://www.jansvenungsson.com//images2/vlgifan.html . I am pleased to be showing my work at APT Gallery this month. The physical process of wandering enables us to draw in information as we move from site to site. However The Places We Go is as much about looking inward (searching what we conceptualise as a “space within”) as looking outward, as the borders between material space and internal space are often blurred. One of the ways a painter learns about life is to explore it: the artists in this exhibition eloquently capture the moment of returning to the start and finding something new in the familiar. 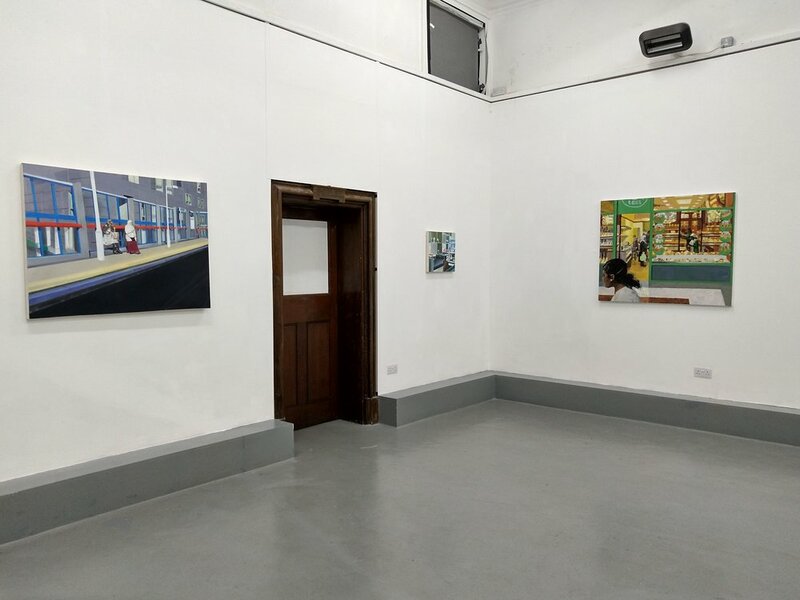 The exhibition Human Traces on the Urban Landscape was at Clare Hall, Herschel Road, Cambridge, CB3 9AL. 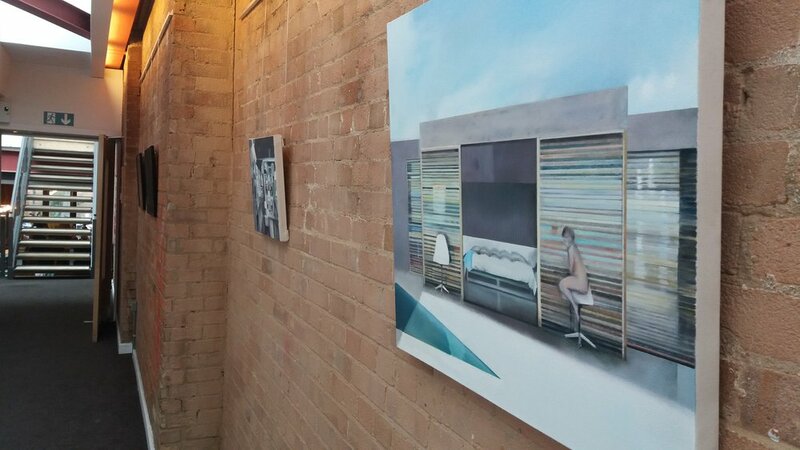 Human Traces on the Urban Landscape, (co-curated with Julie Fountain), was first shown at STOUR Space, Hackney Wick in 2013. The artists: Rosie Snell, Günther Herbst and myself Alexandra Baraitser. The city can be a lonely place, but the tracks left behind form shadows and echoes that are both haunting and inspirational. The 21st century urban space is both riotous and socially complex - a rich layering of networks, multi-racial and political - and yet it can appear empty. The painters Herbst, Baraitser and Snell - through a language both abstract and figurative, leave traces and clues for us to discover and mysteries to solve. In his book on Howard Hodgkin, Andrew Graham Dixon writes how a picture talks of the “human presence” and“remembering somebody in their absence”. Similarly, a focus on absence and presence is provided in this exhibition.